Home > O2 Activated Oxygen > O2 Activated Oxygen 2 oz. We took a cue from basic biology when we decided to bottle the most vital element on earth. We all know how important vitamins, minerals, and water are to our health and vitality. But without oxygen, life ceases to exist in a matter of minutes. In fact, oxygen is so essential to life, it forms the building blocks for all living matter and drives nearly all cellular metabolic functions. Even our abilities to think, feel and act require oxygen-fueled energy production. Since oxygen is so essential to a healthy body, we asked ourselves if there was a simple and safe way to harness even more of this life-sustaining energy source. The answer is O2 Activated Oxygen. O2 Activated Oxygen - is an all-natural liquid supplement containing one of the highest concentrations of bioavailable oxygen available today. Our patented formula provides a potent oxygen boost to help the body produce more energy and maintain peak mental and physical health. O2 Activated Oxygen has up to 350,000 parts per million of bio-available oxygen in every drop. A product six decades in the making, O2 Activated Oxygen's technology starts with a simple solution of distilled water and sea salt. During our proprietary manufacturing process, the solution is charged with an powerful electric current that breaks apart the oxygen (O2) molecules from the H2O compound. These free O2 molecules then bond together to form a highly stable, activated O4 molecule, called polyatomic tetraoxygen. Because the O4 molecule is so stable, it is able to stay suspended in water for up to two years. Other so-called stabilized oxygen supplements contain compressed O2 gas that dissipates once the cap is opened, or else bond their "active" oxygen to salt molecules forming dangerously alkaline oxychlorine or oxy-halogen compounds. O2 Activated Oxygen, unlike its predecessors, is pH balanced (7.4), completely non-toxic, and contains no chemical additives, colors, or preservatives. Just pure bio-available oxygen. O2 Activated Oxygen is a product like no other. Initially developed for commercial waste water purification purposes, the engineers behind O2 Activated Oxygen quickly discovered a dynamic range of uses and benefits, from cleansing the skin to boosting energy levels.O2 Activated Oxygen's balanced pH, non-toxicity and high oxygen content make it the most versatile and safest concentrated oxygen supplement available today. And, because it can be used both internally and topically, it has become a universal oxygen delivery system. is used by pro athletes, medical professionals, health practitioners, students and busy parents all over the world! Oxygen plays a vital role in proper metabolic functions, in blood circulation, in the assimilation of nutrients, in digestion, in energy production, in cellular regeneration and in the elimination of cellular and metabolic wastes. 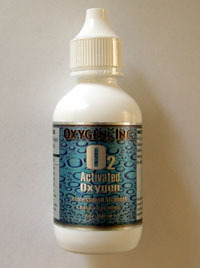 O2 Activated Oxygen is the most well-researched and the safest oxygen dietary supplement available today. O2 Activated Oxygen has been the subject of more than two dozen independent research studies at laboratories and at universities all over the world. Athletes, scientists, educators and health professionals and practitioners have testified to its safety and efficacy over and over again. O2 Activated Oxygen is an all-natural supplement •contains one of the highest concentrations of activated oxygen available today. • is pH balanced (app. 7.4). • contains no chlorite molecules nor hydrogen peroxide. •is non-toxic and safe to use both orally and topically. •promotes energy, stamina, endurance and recovery. WOW! For 12 years I have used this product. Lets put it this way if I don't take my drops I notice. Changed my LIFE! O2 Activated Oxygen 16 oz. O2 Activated Oxygen 32 oz. O2 Activated Oxygen 64 oz. O₂ Activated Oxygen 128 oz.